Restoring old barber chairs is a huge undertaking, but it also has great payoffs. To the right collector, a restored antique barber chair can sell for many thousands of dollars. There is usually no owner’s manual for these kinds of things, so most of the work is DIY. To someone who’s new to the task, figuring out how and where the parts should go is both risky and time consuming. It’s risky because many pieces of the chair are sophisticated, and getting a single part wrong may drastically bring down its value. It’s time consuming since there is essentially no instructional materials to begin with. If you’re the type of person who enjoys watching television shows like Pawn Stars, American Restoration, The Pickers, Salvage Hunters and other similar programs, you probably know how much investment in time and resources a restoration project can take. Take American Restoration as an example. Manpower hours is always a big concern. Each member of the team has his own specialty – from carpentry to metalworking to artwork and anything in between. When you look at the restored item, you’d see the passion and the craftsmanship that these guys put into the project. Doing it by yourself isn’t exactly impossible, but your old barber chairs might not see the light of day anytime soon. Prior to committing yourself to the undertaking, there are things you can do to make sure that you’re on the correct path. In some instances, you may find that the restoration may simply be a matter of wiping the surfaces with a rag. Though in most cases, old barber chairs require taking each piece apart and repainting. Antique items that haven’t been maintained for a long time almost always have paint that deteriorated. Once the surface has been identified, sanding it can completely remove its paint. There are specific sanding methods, depending on the type of paint and the surface. Pay attention to this crucial step, as the wrong type of material can damage the surface as well. Consult an experienced restorer if needed. The barber chair’s hydraulic system may have also deteriorated over time. 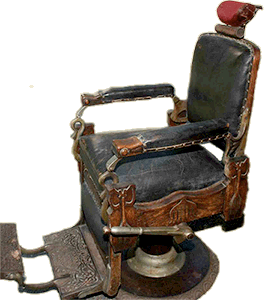 Old barber chairs often use hydraulic cylinders like the machinery used in heavy equipment. In some instances, the fix can be as simple as putting fresh hydraulic fluid. In most cases, the chair has to be taken apart, cleaned and re-oiled. As has been mentioned, this type of restoration requires commitment, and lots of it. It’s best to consult a professional and discuss with other enthusiasts in online forums to find out how to proceed accordingly. Hi everyone i have a large selection of parts for different chairs if you’re looking for parts to restore your chair let me know i might have the parts you need. I have a Koch’s early chair and a foot pedal is missing. I don’t know if that is what I need to raise the chair. The arm bar seems to only recline and put up foot rest and wasn’t sure if that helps raise it or just the foot pedal. ???? Hello I’m in fort worth tx.do you still have it?I could be there yesterday! I have a koken chair from 1910 that is in need of a headrest. Do you happen to have one available for purchase? Couple Theo’s need some odds and ends. Hi Anthony, I just bought an Emil J. Paidar chair and it is missing a headrest. do you have one of those please? I have a Koken early chair and the headrest is missing. Do you have one! Do you restore barber chairs? I’m in Houston do you have any contacts who can restore a Theo Koch chair.. I need to figure out how to make the foot pedal- chair raising mechanism quiet down and stop shaking the floor and walls. Any ideas? I HAVE 2 EMIL PAIDAR CHAIRS,STILL PUMPS UP,WILL GIVE TO ANYONE WHO WILL PICK THEM UP IN HOUSTON,CHROME NEEDS REPLATING. What would be the normal amount of hydraulic fluid in a 1895 oak koken barber chair? I have a barber chair that I know little about. It definitely needs work. How can I find out how old it is and where would be the best place to list it for sale?